The middle image here looks like it might be a wakisashi blade. Ahhhh!!!!!! You just made my year!!! TY! Now the quest reward for helping Terukawa with the Dragon Emperor Hayate is in place! - Cast Greater Restoration, 1 time per day. 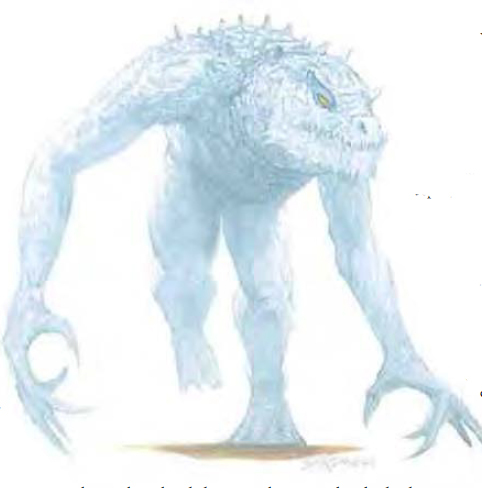 Storm Genasi -- I was thinking it might be possible to take the hair of the Night Hag, convert it into a humanoid hair or helm model, then texture it as pale blue crystal. I'm also going to redo the walkmeshes to reduce walkpathing issues along corridors, and trim the number of faces on the C3 meshes. Good PLan Rjs, I have found myself in a similar place. I like this set for the narrow corridor tiles. The rooms and interfaces always seemed weak in comparison. Are you going to extend the set or just tidy it? I'm starting to have second thoughts now. The narrow corridors -- especially the columns and the tile transitions -- create significant walkpathing issues with 4-6 character parties. I ran into that while beta testing a module, and it created endless problems as characters kept taking the wrong way around. I guess I can persevere, but I know that'll still be an issue with the revised set. Beyond that, I was just planning to include the missing tile types. But I can take a look to see if some other additions can be readily pieced together. 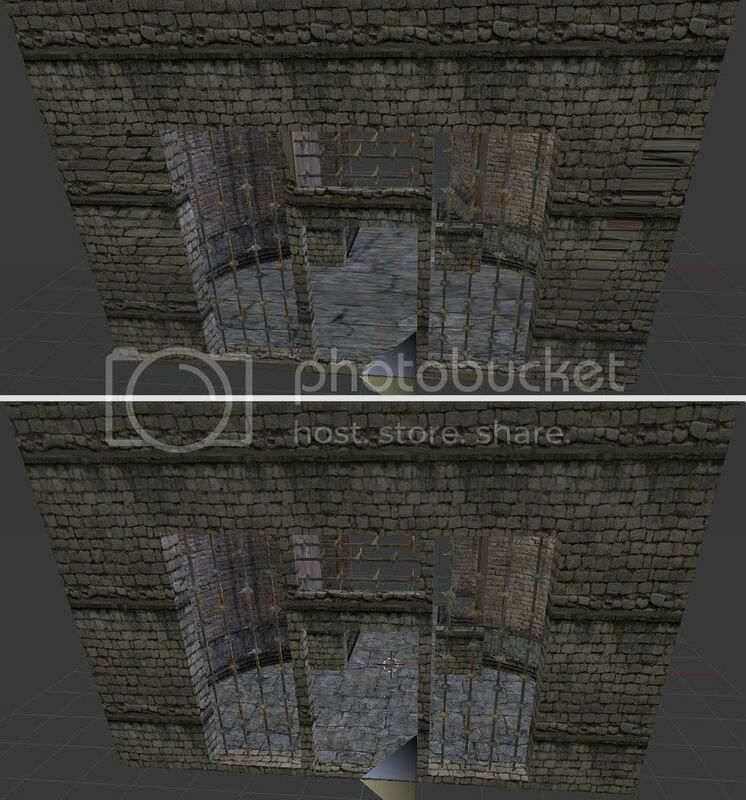 Doing anything for the rws dungeon more than adding the missing standard tiles is icing on the cake. I don't use the tileset that much, just think tilesets should offer all standard tiles, and the one's it is missing can be pretty hard to build around. Maybe with a hair or helmet tutorial I could do that Storm Genasi. I tried examining some custom hairs, even importing the hag head into a custom hair I already had open, but it completely failed to display when I tried in toolset via the override folder (I could select the hair, it was just invisible on the character). Since I use gmax, probably lost a bone or something that was needed for the skeleton. I have no experience working with hairs/helms or anything else that can be worn/carried. Dos anyone have access to the prefabs sets that Nicethugbert did in Yatt. I think I've deleted them and dont see them on the vault. I would very much apprectae a link. I took another stab at the storm genasi hair. It went about as well as a kobold taking on a gelatinous cube. I'm going to have to leave it out there as a request. "Dos anyone have access to the prefabs sets that Nicethugbert did in Yatt. I think I've deleted them and dont see them on the vault. There are too many to link all but they are all listed under NTB's . . . . ..
Could be ported over to NWN2 and made colorable by one of you awesome modders? Would love to be able to put in giant frogs and poisonous toads into my swamps and bogs . . . Thanks, found them now. I searched under YATT perhaps I could have been a little more dillgent in my searching. In case you haven't checked it out yet, FreshLook is apparently working on a way to import/export FBX/Granny files into/out of Blender for use with mdb models in NWN2. It looks intriguing. A little request. This time my buddy can't help. This hak here has a arena type building. The walkmesh is for the center and outside. Could someone make a walkmesh like this possible? Edited! Sorry, was 2-3 AM when I wrote this, mixed up the links. So that I can allow players to watch the fights from up high. This hak here has a arena type building. Mmm, no it doesn't, or at least I can't seem to find it. Next time you might want to point out the model name so people don't need to spend a bunch of time looking through the entire list of parts. Sorry friend, was around 3 AM my time, I mixed the tabs up during copy & paste. To make it up to you, I got the model + textures out of the hak in advance. You can check it out here (172). Hope I got all the textures. They say third time is the charm. Same link (172)as before, hope it is the right one this time. I have no 3d editing software, so I go by the 2da entry, can't verify outside nwn2. I confirmed it bakes okay, but I have no idea whether there will be camera issues. You are a treasure, Rjshae. Thank you! Trying to make it work with walkmesh helpers would have been a nightmare. I don't remember if it has been requested, but there are a wide variety of creatures that are basically just animal head option on a human /half orc body. The dragonborn and one version of the minotaur we have are this for instance, head options for the half orc. A whole new creature out of just a head model based on an existing creature model. Some of the NPC appearance models could be broken down and converted into tintable clothing appearances. For example, Aldanon, Black Garius, Duncan, Jacoby, Lord Nasher, Lorne, Mephasm, Shadow Reaver, and Sydney. There's already one for Torio Claven. Unfortunately they are .max format. Somebody with the right app. might be able to make some nice placeables. I have to wonder how accurate those poly counts are though. I'll have a look (I suspect I'll have to borrow one of my kids' computer first though, as they have 3ds max 2015 and 2016, and my 3ds max 8 is probably too old to handle the new .max format). Cool. Thanks for taking a look. It's done! No screenshots yet, as I'd like to rescale the statues so they fit with the standard size of the others, plus I need to add the C2/C3 boxes, and why not make them tintable. Awesome! 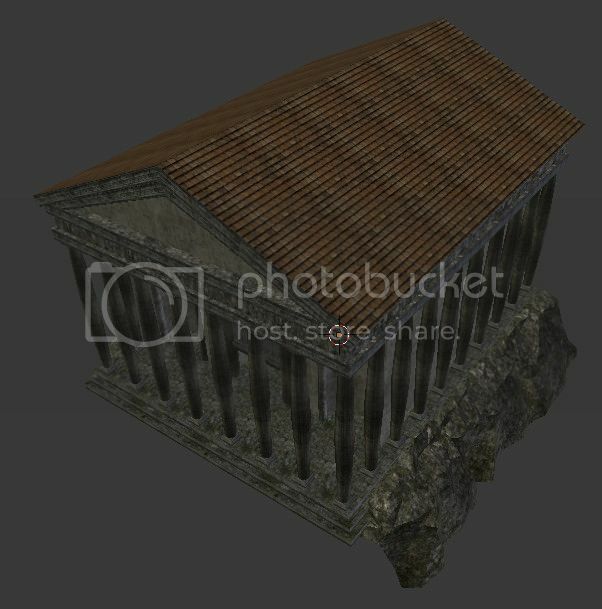 Statues seem to be in short supply for NWN2, so more quality additions will be welcome. 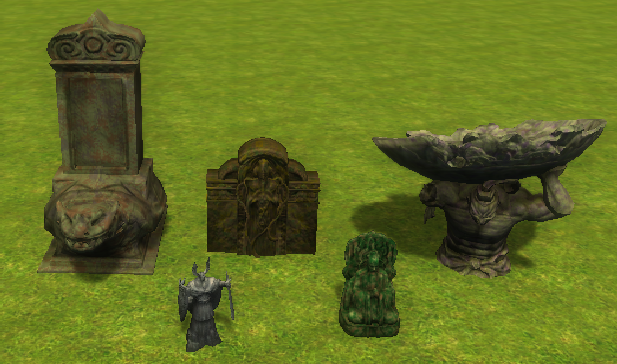 And here they are: https://neverwintervault.org/project/nwn2/prefab/placeable/statues or http://www.nexusmods.com/neverwinter2/mods/1109/? They look really good. Thanks 4760! Physically, the NWN white slaad looks rather similar to the red slaad. A reskin might work, replacing the red with white lightly tinged with blue. Since we already have a red slaad, should be easy with just a white based reskin. Both the red and the blue slaadi could use better textures. The red uses the lizard man body (and the lizard man texture) with a nwn1 convert head (and thus a nwn1 low rez texture). I updated my versions of the blue and red slaadi with the textures for the white slaad. That way, it'll make fewer files (same body, same texture, just different tints). I also noticed the gray slaad looks like a blue slaad with dragon wings, and the death slaad is similar to the green slaad, except with horns and spikes. I'll make a slaad package with all of them, but first I need to add the special features the slaadi have (summon slaad for example). I'll probably have to make a specific subrace for them, so it might take a while. Thanks. There are white slaad in HotU chapter III, so these will be useful down the road. What I think would be handly is a smallish set (3-6) of animations that place humanoid characters in a static, statue-like posture for heartbeat looping. Yes there are various KEMO animations, but none of them are what I'd call a particularly noble posture. If we could put a humanoid/NPC in a static posture similar to those used for the various statue placeables, there would be all kinds of uses. Especially when teamed up with a reskin visual effect. Any chance one of you wonderful modders could make a Irish Deer/Elk for my Moonshae Mod? There is a male deer with antlers, it doesn't have quite the set that one does but it could stand in. It's an alternate appearance of the regular deer and has it's own appearance in my appearance pack. Well maybe someone else will if the male deer doesn't work.